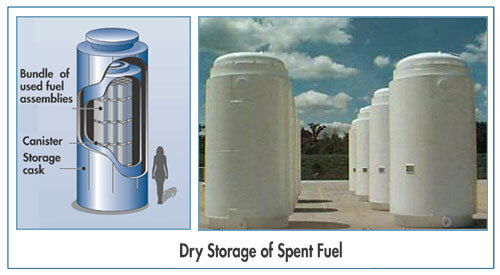 The diagram on the left shows the dry storage concept used for spent fuel in the United States. The photo on the right shows a series of storage casks at a reactor site. The necessary storage licences are issued by the Nuclear Regulatory Commission (NRC). This federal body is tasked with ensuring that facilities are safe, conducting inspections and enforcing safety regulations.